Counterfeiting of U.S. currency continues to be on the rise largely due to the advances in technology which make replication easier, faster and cheaper at a higher quality than ever before. Organizations accepting cash need to be aware and arm themselves with the proper tools to identify suspect counterfeit notes fast, efficiently and effectively. 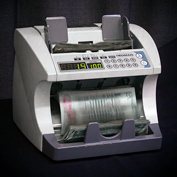 Cash handling and counterfeit detection — fast and efficient, accurate and practical. A basic bill counter that simply counts the number of notes in a stack. Typically these machines will batch for strapping of money, pausing after counting a quantity set by the operator. These machines range in cost from $50 to $700. Quality, commercial units generally start at $400. 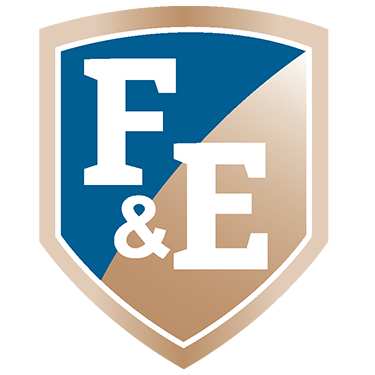 Prices vary depending on manufacturer, speed and quality…better quality machines can run several years before needing professional service. Standard bill counters do NOT detect denominations, value notes much less stacks of notes, nor scrutinize for suspect counterfeits. Single-pocket machines may have all of the features of a two-pocket model, but must stop and pause for the operator to remove the bill(s) from the single output pocket and then press a button for the machine to resume. 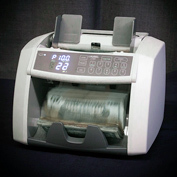 Bill Counter/Sorters will frequently support an attached receipt printer enabling the operator to print the display on the machine including counts and values by denomination and totals. For a quality, commercial-duty discriminator bill counter/sorter, budget $1,000 to $1,500 with a printer. Two-pocket machines provide far more efficient count, sort and authentication of currency as the machine runs continuously through a stack while separating suspects and non-conforming notes into a second “reject” pocket. 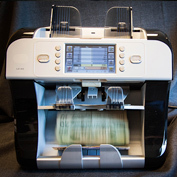 Bill Counter/Sorters will frequently support an attached receipt printer enabling the operator to print the display on the machine including counts and values by denomination and totals. For a quality, commercial-duty discriminator bill counter/sorter, budget $1,500 to $2,750 with a printer.